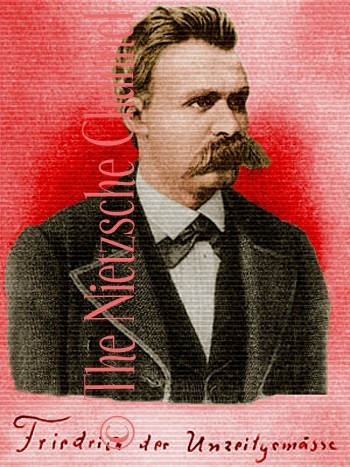 The Nietzsche Channel: Nietzsches Briefe. 1873. 1. Written on the back of the photograph. 2. Nietzsche is referring to Krug's August 1873 engagement to Therese Brummer (who was born in Amsterdam); they were married on Sept. 10, 1874. 3. cf. Luke 16:21: "And desiring to be fed with the crumbs which fell from the rich man's table ..."
4. cf. 1 Corinthians 13:4: "Love is patient, love is kind; it's not envious, it's not puffed up [with pride]." 5. "Freunden zum Trost, Feinden jedoch": an allusion to Richard Wagner's Kaisermarsch chorus ("Feind zum Trutz, / Freund zum Schutz"). 6. The last line is the conclusion of the complete poem from Nietzsche's November 13, 1871 letter to Krug. 7. Written on the front of the photograph. A moniker alluding to his Untimely Meditations.